Every adolescent kid in my part of Queens loved Smokin' Joe Frazier. He was our favorite. Tough as nails. Served his country. Never gave up. Heavily favored, and expected to somewhat easily get past Olympic gold medalist George Foreman in January of 1973, Frazier was seemingly on his way to a rematch the following year with Muhammad Ali. One thing would change that day in Jamaica... that was the public perception of "Big" George Foreman. Duncan Hines? No. 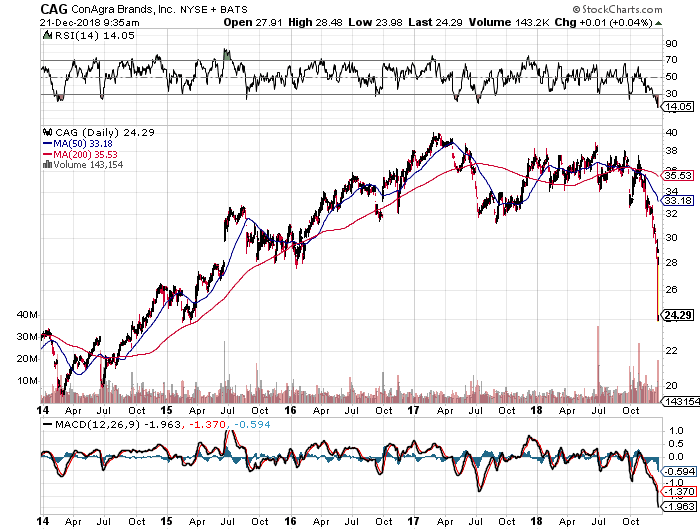 Down goes Conagra Brands (CAG - Get Report) . The firm reported their fiscal second quarter on Thursday. Once again, the story is retold as it has been now every morning and night. An EPS beat on expectations. A revenue beat as well, and then it happened. Disappointing guidance. The bogey man of late 2018. Go look in your fridge. On your shelves. Conagra is there. Not just Duncan Hines. Vlasic. Reddi Whip. Birds Eye. Gulden's. Hunts. The list goes on and on. I could tick off the editors just by listing them. Point is everyone you know is a regular client of this firm. Certainly a Staple that should in theory make this stock an attractive holding in a volatile market. However, the firm guides FY 2019 adjusted EPS to a range of $2.03 to $2.08. Consensus view had been up around $2.12. The problem is this. Net sales this past quarter were indeed flat for grocery and snacks, with a significant decline in organic net sales. The Refrigerated and Frozen segment grew enough to nearly pair off for the bottom line. In the end, the firm expects to see cost synergies exceeding target after factoring the integration of Pinnacle Foods. That is ultimately where the potential for margin expansion will come from. Just not yet. You know the firm did reaffirm sales guidance for it's legacy brands. Not a lot to love here, but not really much to hate either. After yesterday's drop that seems to have held, the share price has been knocked back to early 2015 levels. I think I could, and I may actually do this myself after we publish, buy a few of these. This is not a trade, gang. This may not even be an investment. What it is is a relatively cheap (10 times forward PE) dividend payer. CAG will pay shareholders 3.5%. Bottom line is that maybe the air is out of the balloon here. The reason to have this name somewhere on one's book is to be a shareholder of record by January 30th for a March 1st payout. For every year that CAG stays in a trader's portfolio, net basis drops 85 cents. -Purchase 100 shares of CAG at or close to the last sale of $23.94. This set up reduces net basis to $23.32. If the trader is still long the name on January 30th, basis will drop another 21 cents by virtue of the dividend payment. The idea would be to sell a similar call every month as the current month expires. This will drive net basis into the ground even if the stock stagnates.